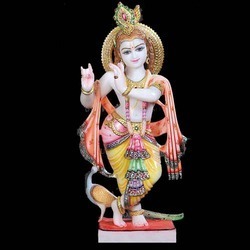 We are also engaged in offering a beautifully crafted range of Shri Krishna Sculptures. The array is made bet quality materials and stones and is available in varied different style. We offer this range to our clients at best industry prices. 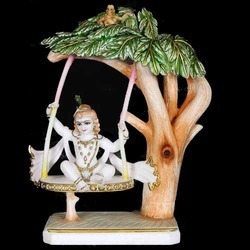 Our range of Shri Krishna Sculpture sitting on swing is a popular series among our vast client base. In this sculpture, the childhood of Kaanha is depicted elegantly. Our artisans make use of wide strokes of color to highlight key features. The range is made from quality stones and marble and the flat bottom provides it a stationary base. The range is offered by us at best industry prices. 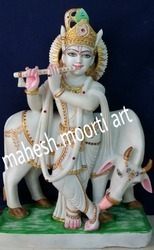 We offer an attractive collection of Shri Krishna Sculpture , which is made from pure marble stone. The range comes as a set of two sculptures, in which Krishna and Radha are depicted. Crafted by seasoned artisans, these are considered as masterpiece of art on stones. The range comes with a flat base to provide ample stationary support to prevent the statues from falling. Our array is available at competitive rates. 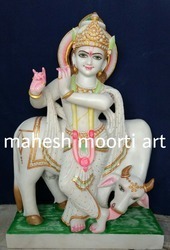 Our range of Marble Statue of Krishna with Cow is one of the most admired series offered by us. This collection is made in finest quality marble stone and is painted with best quality paints. The range depicts true beauty of Krishna, and is available in various sizes and styles. We offer the range to our clients at nominal prices. Our organization is instrumental in providing Lord Radha Krishna Statue which is worshiped y the devotees all over the world. 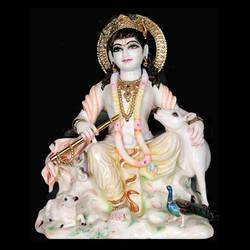 These statues are elegantly designed by the master craftsmen in alluring designs and patterns utilizing premium quality marbles an stones. 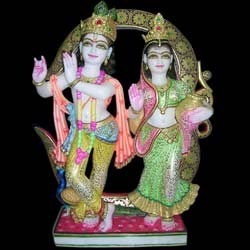 This Lord Radha Krishna Statue is suitable for keeping at homes, temples and reflects a blend of mesmerizing colors with sheer elegance and glory. Our Radha Krishan sculpture in which shri Krishna is depicted playing Flute and Radha on her side in with a pot is truly a classic art form. 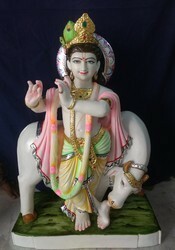 The depiction of deities in this form with multiple variant colors and highlighting the key features with golden color and steaks enhances the sculpture quality. These are widely appreciated by our clients. These are available in the market at reasonable rates. 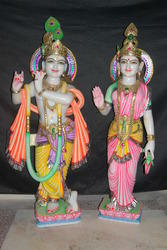 Looking for Shri Krishna Sculptures ?